Did you know there are up to six Wienermobiles on the streets at any time? Now you can locate any of them within 200 miles, thanks to Oscar Mayer's new dedicated Wienermobile app. Designed by agency Gravity Jack, the app will include a game where users can virtually race the iconic 27-foot hot dog on wheels. Game players can earn "Wiener Bucks" points by scanning various packages of Oscar Mayer products on store shelves. While the Wiener Bucks do not lead to coupons or discounts, they let players race with elements seen directly below. Consumers also can take photos of the vehicle in real life and upload them to the mobile-social app, and a Park In My Driveway section lets them insert an image of the Wienermobile into any picture and share across social media channels. The digital effort became available for download today in Apple and Google's app stores. In coming weeks, Oscar Mayer-branded local events around the country will feature iPad stations, pre-loaded with the app, where consumers can entertain themselves with its game and gain access to bonus features. 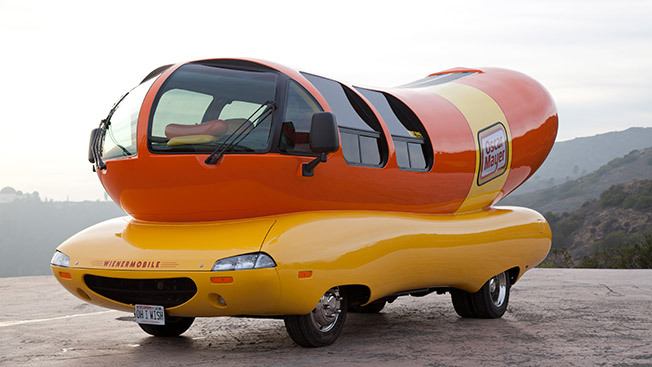 Madison, Wis.-based Oscar Mayer has brought the Wienermobile on board to follow up on its bacon-scented iPhone alarm app that garnered buzz in late winter, as well as its #Tweet2Lease spoof effort via Twitter in January. Now, the brand is obviously trying to build greater buzz as picnicking activities are in full swing through Labor Day. Whimsical-but-dedicated app endeavors such as the Wienermobile are are a bit of a risk because it's becoming extremely uncertain whether they pan out. In a crowded mobile app space where consumers are increasingly selective about downloads, the challenges for brands to gain traction appear daunting.